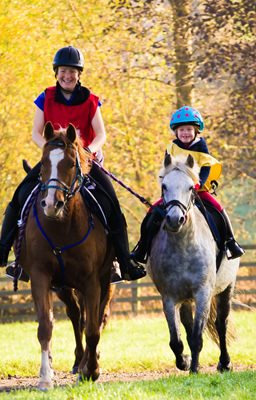 Endurance riding in the UK is an ever growing equestrian sport catering for all ages, abilities and types of horses. PR’s (Pleasure Rides) or TR’s (Training Rides) – these can range in distance from a 5km lead rein class to around 32km rides. At national level rides where there is a pleasure ride, horses must trot up before a vet at the start of the ride and also on completion. Pleasure rides are to be completed at between 8km/hr and 12km/hr and can be more easily achieved by all riders. Pleasure rides are run by regional groups of Endurance GB and open to all. These events can also include fun activities such as treasure hunts, fancy dress, pairs and team classes. GER’s (Graded Endurance Rides) – these add an element of competition to your ride, as well as the opportunity to ride longer distances. GER’s range from 32km all the way up to 160km, however they are divided into three steps: Novice, Open, Advanced. All horses must pass a vet as well as a heart rate check. On longer distance rides, riders must complete a series of loops and rest period. Grade Points are awarded depending on speed and heart rate. ER’s (Endurance Rides) – considered the top level of endurance competition, ER’s are long distance race rides, where all riders set off together and aim to complete in the fastest time. ER’s are usually between 80km and 160km in length and include a number of rest ‘holds’. Horses can gain time in ER’s by presenting quickly to the vet with a low heart rate upon completing a loop. Many riders at this level progress to FEI level ER’s, the highest level of endurance competition both in the UK and abroad. All endurance rides are marked by either tape or spray paint at key points along the route, however a basic level of map reading is required at all levels.